Angel and Wayne Smith own a 100-acre farm in Clearville, PA, with more than 500 blueberry bushes (where visitors can pick their own), 12 beef cows, plus hay and a large vegetable garden. They are among a circle of property owners surrounding Spectra Energy’s huge compressor and underground natural gas storage facility with 13 injection/withdrawal wells. The Smiths and other property owners are, by necessity, volunteer ‘citizen regulators.’ They track incidents related to health, water, operational complaints – even livestock deaths – near the facility in Clearville known as Steckman Ridge. Spectra Energy was repeatedly asked for comment, but no response has been forthcoming to date. 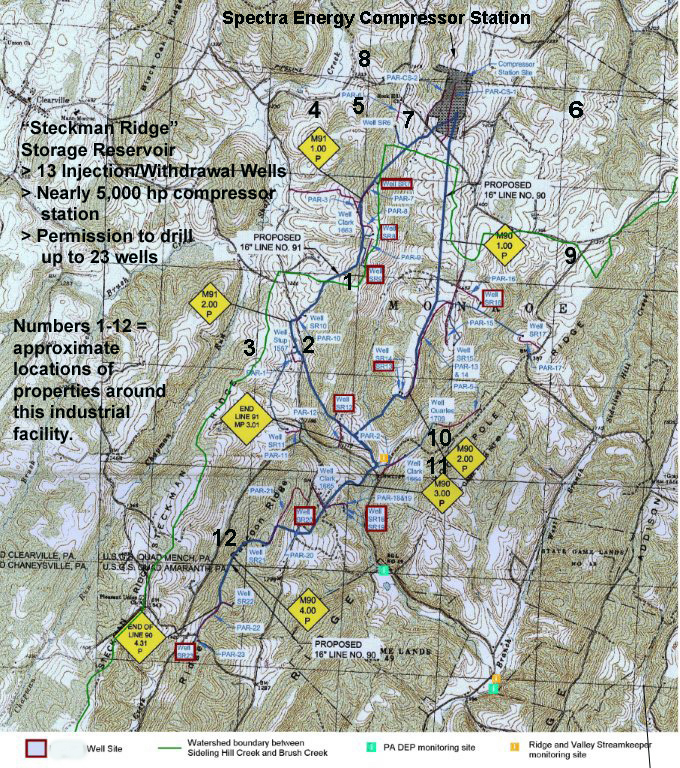 In addition, a compressor station is a “critical component” at any natural gas underground storage reservoir, according to a Spectra Energy brochure published for Winter 2010 and mailed to residents. Angel and Wayne Smith’s property is number four on the attached map and is near injection/withdrawal well SR6. According to the Federal Energy Regulatory Commission (FERC), SR 6 was placed into service in May of 2009. Their ongoing problems with Spectra Energy’s heavy industrial facility in Clearville are a matter of public record. They have filed a lawsuit against Spectra Energy’s Steckman Ridge, LP. It is currently in federal court for the Western District of Pennsylvania (Johnstown). Their lawsuit alleges illegal taking of their property rights for the company’s gas storage field. In addition, their suit contends that the company is responsible for the contamination of their water supply, via its storage facility. Water levels in their well, pond and a nearby creek rise and fall in synch with the operation of the nearly 5,000 horsepower compressor station, according to the Smiths. Since May of 2009 when Spectra Energy’s SR6 well was officially placed into service, the Smiths say they have lost approximately two dozen livestock and pets. This includes a 600-pound steer, 3 calves, one cow, 3 dogs, 12 chickens and 4 cats. Recently, there is an unconfirmed report of more livestock deaths – ten young animals; but we emphasize that this is second-hand information. If the information is accurate, Spectra Energy will no doubt report it to FERC and/or the Pennsylvania Department of Environmental Protection (DEP). Livestock and pets can die for many reasons, but the pattern is disconcerting in Clearville. Moreover, the industry treats such incidents as anecdotal or isolated. But the more one looks from Pennsylvania to Texas, many adverse effects follow a pattern near gas industrial operations. Property owners in several states have learned that they must, in effect, become citizen regulators who track and record incidents at gas industry facilities – from drill sites to pipelines to compressor/storage reservoirs. The Steckman Ridge compressor station – with homes nearby and an elementary school 3 miles away – has had problems from the beginning with shutdown/blowdowns that can result in uncontrolled releases of Volatile Organic Compounds and, sometimes, a liquid contaminate which has fallen on nearby properties. Despite Spectra Energy’s stated commitment to transparency, accountability, safety, and being a good neighbor, the company declines to share statistics on compressor station performance across its system. For example, it operates a major compressor station nearby known as the Bedford Compressor Station. In addition, it operates a compressor station and natural gas underground storage facility near Accident, Maryland – less than two hours from Steckman Ridge in Clearville, PA.
Facts about comparative performance could help stakeholders understand if the problems at Steckman Ridge are typical. This information has been furnished to FERC which is reviewing it with Spectra Energy to determine what is going on. Maggie Suter, who is the FERC project manager for Steckman Ridge, took pains to explain the difference between shutdowns and blowdowns, based on what she learned from Spectra Energy. Why is this heavy industrial facility having such frequent blowdowns? Recurring patterns of adverse effects generally indicate something is wrong. As Sharon Wilson of the Texas Oil & Gas Accountability Project points out: The goal of the gas industry is to dismiss case after case as anecdotal, ignoring the growing pattern. Such a pattern is visible near Spectra Energy’s Steckman Ridge storage facility in Clearville, Pennsylvania. In part 3, we hope to share comments from Spectra Energy about the operations of its Steckman Ridge storage facility, as well as information from PA DEP. If not, we’ll have more to share about operations at the heavy industrial facility.